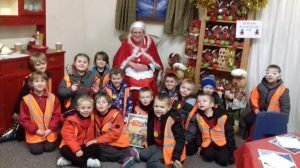 Key stage one had a fantastic day at Rand Farm Park on Thursday 7th December 2017. As part of our Christmas experience we got to decorate biscuits with Mrs Claus, they were delicious! We had a magical time going through the enchanted forest on our way to meet Santa and his elf where we got to choose our own gift from his workshop, did you know that the currency at the North Pole is chocolate coins? After lunch we went on a bumpy tractor ride around the farm and fed the animals, it tickled our hands feeding the cows and goats but we all had a fabulous time and were very tired from our fun-filled day.